EXTRA LONG&HEAVY DUTY:30inch sticks long distance are perfect for keeping a good distance from patio fire pit, backyard fire pit, bonfire pit, or campfire.5mm diameter sticks means that whether it is a fully-loaded stick of marshmallows, or a hotdog, sausage, kebab, or any other delicious food ideal for roasting, FLYPARTY stix can handle the weight. ECO-FRIENDLY&SAFE:Made of 100% natural bamboo material,FDA approved,sustainable and degradable, environmentally friendly product. KID SAFE:The Marshmallow sticks was crafted with semi-pointed ends so they’re safe for age-appropriate children. 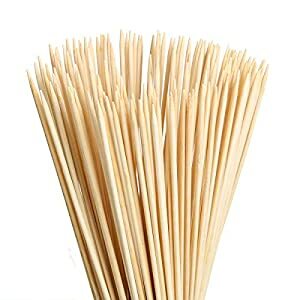 Everyone loves a roasted marshmallow; let them create the marshmallow themselves with our bamboo roasting sticks.